Breaking Tradition, Pope Confesses His Sins In Public : The Two-Way Pope Francis stunned even his master of ceremonies, when he kneeled before a priest to confess his sins. Pope Francis leads a mass at St Peter's basilica on Friday at the Vatican. Pope Francis broke tradition, again, today by confessing his sins in public. 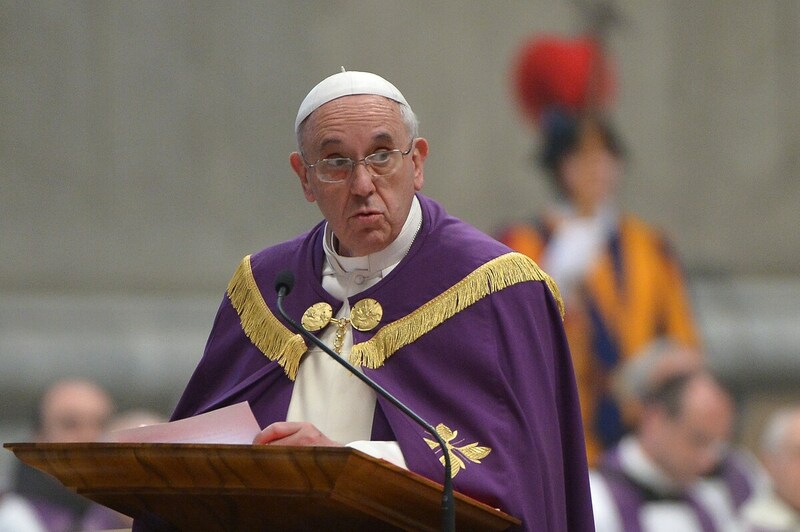 As The Catholic News Service reports, the pope was leading a penitential liturgy in St. Peter's Basilica when it came time to hear confessions. Instead of heading into an empty confessional to hear the confessions of fellow priests, Francis walked across the aisle and knelt before a priest. The AP reports Francis confessed his sins with his back to the camera, so it was not possible to read lips or hear what he said. "At one point, the priest hearing his confession appeared to chuckle," the AP writes. "Francis, solemn-faced, then rose and started hearing confessions himself." Reuters reports Pope Francis goes to confession regularly, but does so in private. "In his homily, Francis tweaked some religious commandments to stress the positive. Building on 'don't' steal,' Francis suggested, 'share what you have with others,' especially the needy, and when trying to 'not yield to anger,' he advised, be 'magnanimous and ready to forgive.'"